SSC GD Constable Application Form 2018 Apply Online: Staff Selection Commission (SSC) has released the notification for 54953 Constable GD posts. Candidates seeking to get central government jobs can apply through SSC official website, ssc.nic.in. Interested and eligible aspirants can apply from 21st July to 20th August. SSC inviting applications from the eligible aspirants. Candidates can apply through online on SSC Official website. Candidates seeking to apply for SSC Constable GD posts can check other details such as eligibility criteria, application process, selection process, pay scale, important dates and other details from the following. SSC GD Constable Apply Online Registration: Staff Selection Commission annually announces various jobs for the interested and eligible aspirants. SSC has announced the Constable GD posts for various departments such as BSF, ITBP, SSB, NIA and SSF, Rifleman in Assam Rifles and CRPF. Candidates wishing to become the SSC Constable can apply for these posts. Aspirants must have the minimum educational qualification of 10th class pass and age limit must be in between 18 to 23 years. Candidates belong to the reservation category will get the benefit of age relaxation as per the SSC norms. 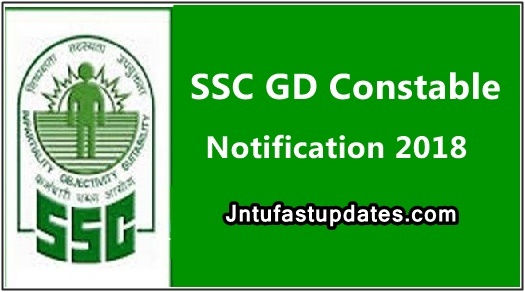 Candidates seeking to apply for SSC Constable GD posts can go through SSC Constable GD notification 2018 PDF for more detailed information. For the convenience of aspirants, here we have mentioned the brief details regarding the SSC Constable GD recruitment. To apply for SSC Constable Vacancies candidates must have the eligibility criteria. Educational Qualification: Applicants must have passed min of Matriculation/ Class X or equivalent from the recognized university/ board. Age Limit: Candidates age limit must be in between 18 years to 23 years as on the closing date of applications. And candidates come under reservation category will get age relaxation benefits as per Govt norms. How to Apply for SSC GD Constable Posts 2018? Candidates interested to apply for SSC GD posts can apply through SSC official portal, ssc.nic.in. Application dates are from 21st July to 20th August. Interested and eligible aspirants can apply during these days. General / OBC Candidates: Rs. 50/-. Candidates can pay the application fee through online/offline modes. To pay the application fee online candidates can pay through any of the valid debit/credit cards. And to pay the fee through offline, candidates need to pay it in any of the branches of SBI using the challan. Check the SSC GD Constable Pay Scale details from the official notification.